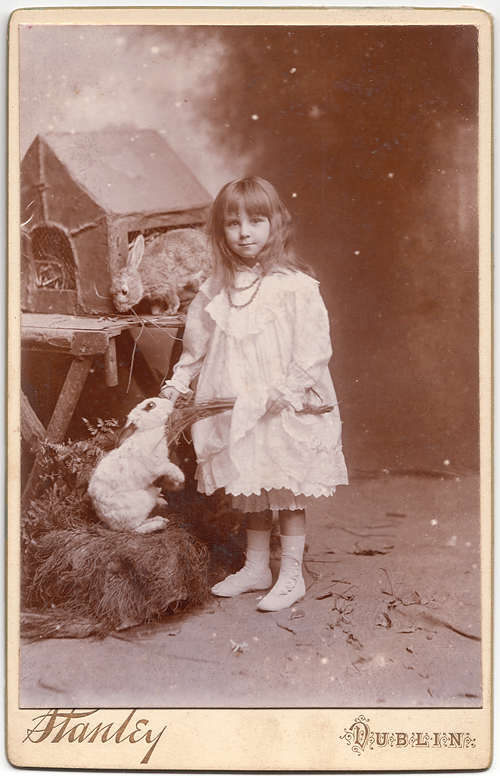 Happy Easter from 1910s Dublin – cabinet card by the Stanley Studio featuring stuffed rabbits! Stuffed animals were popular props in photographic studios. 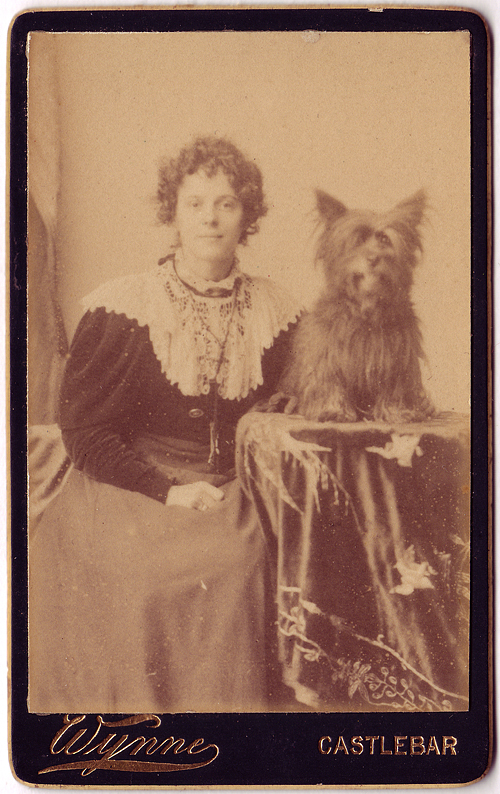 In an earlier post I refer to a cabinet card by Lafayette which features a stuffed dog! I like the way the photographer has included a hutch for the rabbits to ‘live’ in and also how they have occupied the child in ‘feeding’ the pet. Note how you can see where the backdrop meets the floor covering. A hand-written note records that the photograph is of ‘Aileen at the age of 4 years and 10 months,’ no surname is provided. The census shows that there were 74 Aileens under ten years’ of age living in Dublin in 1901 and 95 in 1911. Perhaps, she was one of these? The photograph is in the cabinet card format which was 108 by 165 mm (4¼ by 6½ inches). The back of the card states that the Stanley Studio also specialised in landscapes and that they were based at 22 Westmoreland Street, facing O’Connell Bridge. This address is known as the Lafayette building, after the photographic studio of that name, and was built in 1890 for an insurance company. The Dublin historians who write at Come Here to Me have a post on this building and the Dolphin Hotel which was also designed by J.J O’Callaghan. The girl’s outfit includes a long-sleeved white cotton smock or dress with matching pantaloons and beautiful white kid leather side-buttoned boots. The dress appears to have several layers and is full of pin-tucks, flounces and scalloped edges. She is wearing a necklace over the broad ruffled collar. Her dress reminds me of the one worn by the painter John Lavery’s stepdaughter in The Artists’ Studio. You can see the painting here. It was completed between 1909 and 1913 a timescale which fits in exactly with that of the Stanley Studio. I have posted photographs of dogs and their owners taken in Irish studios before and thought that this pair were a nice addition to the series. They were taken by two very different studios: the Wynne business was based in the small town of Castlebar, County Mayo whilst the Werner family had several fashionable locations in Dublin’s city centre. Louis Werner (1825-1901) came to Ireland from Alsace in the mid-nineteenth century and was originally engaged as a portrait painter. He had switched to photography by the 1860s and I’ve featured several examples of his work elsewhere on the blog. The business was eventually taken over by his his son, Alfred who also exhibited his pictoralist photography internationally at the Chicago World Fair in 1893; the 3rd Exposition d’art photographique, 1896, Paris and the American Institute Photographic Salon, New York, 1899. He favoured the platinotype or platinum print which gives a great tonal range. 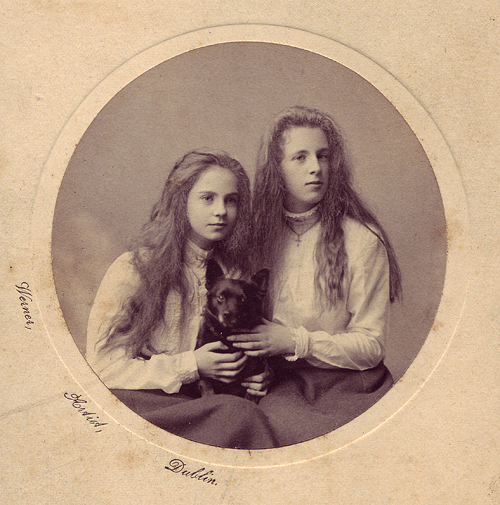 I love this portrait of two Dublin sisters and their small terrier dog. The girls’ flowing hair is shown beautifully and I reckon, their matching outfits date the photograph to the 1900s. The earlier carte-de-visite by Wynne’s is great fun. The dog and owner are sporting a similar shaggy hairstyle and the photograph is full of great detail from the woman’s beautiful lace collar worn with a crucifix necklace to the velvet embroidered tablecloth. The National Photographic Archive have an amazing photograph of Thomas J. Wynne advertising his business ca.1880 in which you can zoom in on the details of the products he was selling. By 1901, the family also had branches of their photographic business in Tipperary Town and Loughrea, County Galway, the latter being run by 34 year-old Delia Wynne. This wedding photograph is a rich resource for anyone interested in the history of Irish costume or in wedding styles. It was taken ca.1910 by John McCrae who ran a studio in Phibsborough, opposite the Mater Hospital and another at 113 Grafton Street, Dublin. The ostentatious hats come in a variety of styles and materials including velvet, straw, lace, ribbons, ostrich feathers and even fur! Hats were definitely a means of conspicuous consumption for wealthy Edwardian women. Bonnets and caps were often favoured by the older ladies. Even the little girl at the back of the photograph wears a coif cap decorated with lace, a large ruffled collar and a full skirt. She is also wearing leather gloves! The bride and her bridesmaid wear fashionable ankle-length skirts and matching cream bodices with a slim pinstripe. The bodices are embellished with cutwork at the neck and three-quarter length sleeves. Both wear lace blouses with high elongated necklines and sleeves of Guipure lace. All the ladies wear gloves and jewellery with most displaying brooches fastened at the neckline of the their lace blouses. Two of the guests wear the highly popular tailor-made suits which included long narrow skirts and matching three-quarter length jackets. The young girl is the only female at the wedding without a hat and the little boys are wearing typical knee length white jersey suits with black shoes. In contrast to the elaborate nature of the women’s outfits, there is little variation to the men’s attire. All wear single breasted sack or lounge suits with waistcoats. These are matched with stiff white rounded collars which were probably detachable – see here for a detailed outline of their use in the 1900s. The photographer has succeeded in taking a good group photograph in which all of the party are clearly visible and calm looking. See here for another example of his work which I have blogged about previously. Unfortunately, I do not know whereabouts in Dublin the photograph was taken nor the name of the family! These photographs are from one of my recent acquisitions: an album of photographs, mostly snapshots, taken by a County Cavan family between 1900 and 1920. William Coyne is wearing strangely formal attire for a photograph taken in the backyard of a Dublin house: the full dress suit is matched by a stiff white collar and top hat. Sarah’s upswept hair and lace blouse/skirt combination were typical of the early twentieth century. I haven’t been able to definitively locate the Coynes on either the 1901 or 1911 census. He might have been the statistician William P. who in the 1901 census lived on St. Stephen’s Street or the Chief Inspector of Great Northern Railways who resided in Phibsborough? Despite the serious demeanour of the humans in these photographs the images make me laugh. The cat’s arched back is caught perfectly by the camera and the dog’s quizzical expression, as he stares up into this owner’s face, add a comical twist to an otherwise grim atmosphere.